When acupuncture burst onto the scene in the U.S., and grew over the decades, one of its biggest uses was in joint pain. And scores of medical studies have suggested that, indeed, it seems to reduce pain and swelling in patients with arthritis. Knee osteoarthritis was one of the central conditions it has been found to help treat. Surgery can be effective, yet it is far from perfect. It’s estimated that one in seven patients feel severe pain return years later. It’s also expensive and impossible for many uninsured Americans. For the landscape of people suffering knee osteoarthritis, there deserves to be more solutions to end the constant pain and poor quality of life. Participants in the study got acupuncture once a week for one month. After that, it was once every six weeks. After one year, 41 kept with the acupuncture and, after two years, 31 were still electing to go. On average, each patient got about 16 sessions. Researchers used a score to measure the people’s symptoms, ability to move around, and well-being. The study showed that one month of acupuncture led to significant improvements in pain levels, stiffness, and functional capacity. And the improved life continued throughout the two-year study period. Acupuncture is an amazing thing. To believe in it fully, you must invest in the notion that a flow of “Qi,” or life energy, courses through your body. 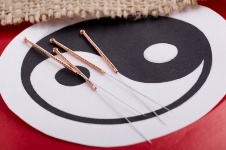 The needles of acupuncture are inserted in specific spots on the body that correspond with Qi, and they bring it back in balance. To some, it could be a tall order to break through their pessimism, yet the effectiveness that patients report supports the alternative therapy. Acupuncture is painless. It should be performed by a Traditional Chinese Medicine practitioner, and it will likely take many sessions before you see a true, lasting difference. The reduction of pain is its best use.